Ramat and Snowgum Lodges are just over a kilometre from the centre of Niseko Hirafu Village, which is the main village of the world famous Niseko ski fields located on the northern Japanese island of Hokkaido.The free local shuttle runs daily between 8.30am – 8.30pm with the closest stop only 50m from the lodge and only takes 5 minutes to get you to the lifts. We also run an in-house first tracks shuttle service to get you to the ski lifts (only 1.5km away) for the very first ski runs every morning. 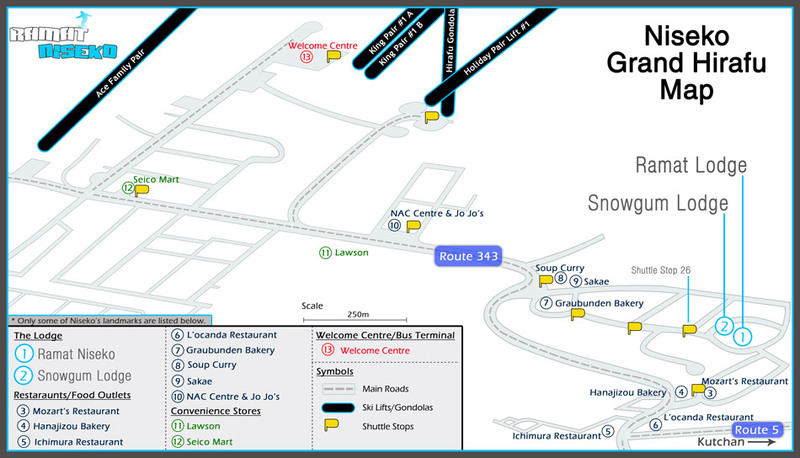 Have a look at our getting around page to see how easy it is to get around Niseko.